On a trip from Chicago to Seattle with my daughter, we had a few short minutes to stop and see the Elam Residence. It is just a few minutes off the interstate in Austin, Minnesota. 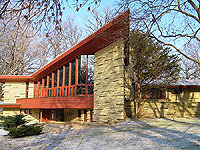 Designed in 1950, and completed in 1951, this Wright residence is truly a work of art. Not much has been written concerning the S.P. Elam Residence or S.P. Elam. 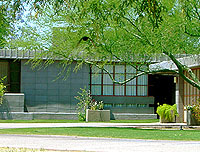 According to Storrer, the Elams were touring Taliesin and mentioned that they were interested in Wright designing a home for them. John Howe suggested that they see Mr. Wright, who met with them immediately. They later had a falling out with their architect and had to finish their kitchen without his design. According to the currents owners, a few years after the home was completed, the Elams ran into financial difficulty due to the devastation of their orchards in California. They were forced to place the home on the market. The present owners lived down the street, or were looking to purchase a home down the street when she saw the Elam home for sale. They made an unrealistically low offer and the Elams, due to their situation, sold. limestone came from a quarry near Taliesin, where as the Shavin sandstone was from Tennessee. It is designed on a four foot grid plan. The home faces the Southeast. As you approach from the Southeast what you observe are the massive stone piers that support the dramatic cantilevered balcony and roof, and a row of vertical doors and windows. The roof above the Workspace is flat and than soars like a mountain growing out from the prairie toward the Living Room on the other end, supported by a massive stone pier. One of the most sticking elements of this home is the cantilevered balcony. It is cantilevered out ten feet, and the glass Living Room wall rests on the balcony, four feet past the center of the supporting wall below. A Playroom that mirrors the Living Room. Two massive stone fireplaces. There are five mitered glass corners. Additional Entrance doors that open outward to allow air to flow through the upper level. There are rows of doors and windows that open outward. Built in planters. 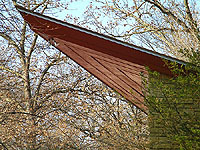 The Elams used cypress board and batten siding and cedar shakes on the roof. All exterior cypress has been painted. The University of Minnesota houses photostats of drawings and blueprints for the S.P. 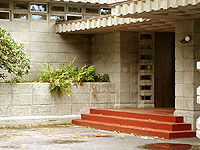 Elam residence in their Frank Lloyd Wright collection, Northwest Architectural Archives, Manuscripts Division. There are many classic Wright details. 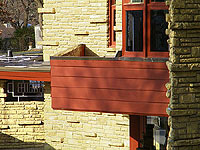 The stonework is reminiscent of Fallingwater, Taliesin and the Shavin Residence (1950). The home faces the Southeast. As you approach from the Southeast what you observe are the massive stone piers that support the dramatic cantilevered balcony and roof, and a row of vertical doors and windows. The roof above the Workspace is flat and than soars like a mountain growing out from the prairie toward the Living Room on the other end, supported by a massive stone pier. One of the most sticking elements of this home is the cantilevered balcony. It is cantilevered out ten feet, and the glass Living Room wall rests on the balcony, four feet past the center of the supporting wall below. A Playroom that mirrors the Living Room. Two massive stone fireplaces. There are five mitered glass corners. Additional Entrance doors that open outward to allow air to flow through the upper level. There are rows of doors and windows that open outward. Built in planters. The Elams used cypress board and batten siding and cedar shakes on the roof. All exterior cypress has been painted. 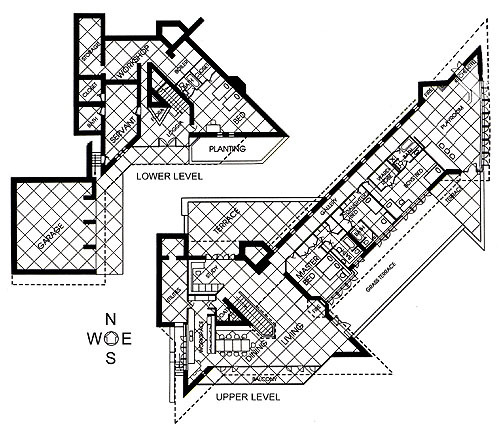 Floor plan copyright 1993, �The Frank Lloyd Wright Companion� Storrer, William Allin, page 356. Edited and Photographed: Futagawa, Yukio, 1990, page 320-321. �The Frank Lloyd Wright Companion�, Storrer, William Allin, 1993, page 356. "Frank Lloyd Wright - Field Guide, Volume 1, Upper Great Lakes" Heinz, 1996, page 30. 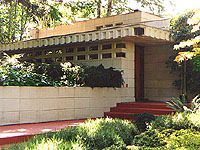 "The Vision of Frank Lloyd Wright" Heinz, 2000, page 240. "Frank Lloyd Wright, Complete Works 1943-1959", Pfeiffer; Gossel, 2009, pages 231-232. "Northwest Architect - July - August 1969", pages 42, 71, 73, 75, includes six photographs. Transcription of a conversation with Mr. & Mrs. S. P. Elam, June 1969. Does indicate when they moved out, but does indicate that the home was now owned by Judge & Mrs. Warren Plunkett.